- Do you have any documentation that describes this process from a layperson's perspective, with deliverables for assessing and addressing incidents like this, and roles and responsibilities? DEQ will shortly issue the confirmed release letter which will request from INOVA an initial abatement report, typically due in 30 days, describing the initial (ongoing) response, and a site characterization report, typically due in 90 days, describing the extent of petroleum contamination in the subsurface and assessing what risks exist and what, if any, long term corrective action may be necessary to abate those risks. Depending on what those investigations find, additional investigation, monitoring, or corrective action reports will follow until the release has been adequately abated to allow the case to be closed with no ongoing significant risks to human health or the environment. - Has or will there be any downstream testing to assess the impacts of fuel that entered the watershed? Given the multitude of other sources of petroleum in the surrounding environment (e.g. I-495) we don't typically find surface water analyses for petroleum contaminants useful any significant distance downgradient of the release. Sampling and analysis of the stormwater discharge from this property will likely be part of the characterization and long term monitoring requirements for this case, however. - Have or will groundwater monitoring wells be installed to identify potential contamination plumes? Groundwater monitoring wells will likely be part of the site characterization. - There seems to be uncertainty about how much fuel left the property. What's the time frame between the incident that caused the leak (or the last known good status), and when the leak was detected? It appears that the bulk of the release is in the subsurface around the USTs (underground storage tanks), but that will be one of the subjects to be addressed by the site characterization. Regarding the time frame of the leak, tank test and inventory records are being reviewed. - Is there documentation of previous similar issues at this site, such as soil, groundwater, or watershed contamination from toxic releases, including prior to INOVA's occupancy? There are several previous petroleum releases for this property. Please email a FOIA request to nrofoia@deq.virginia.gov and ask for records for 3225 Gallows Road, Fairfax County and they will provide you the relevant files. 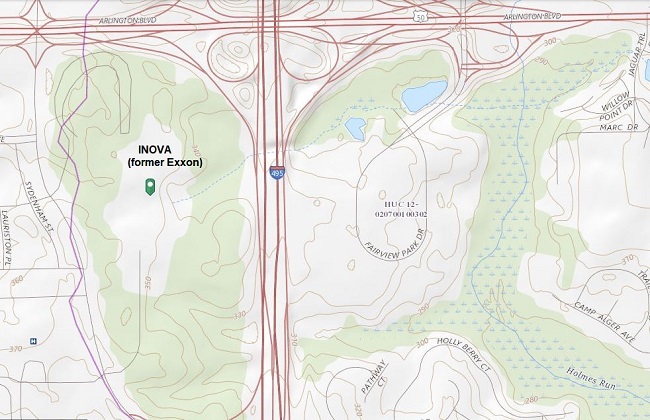 Fairfax County Fire and Rescue Department Hazardous Materials Response Team responded to the INOVA (former Exxon) Gallows Road campus for a report of a diesel fuel spill. Units identified approximately 3,700 gallons of diesel fuel had spilled out of storage tanks. Fire Department reports indicated the leak was largely contained to the property, however small amounts did leave the property in stormwater drains and small creeks heading to Holmes Run and Lake Barcroft.